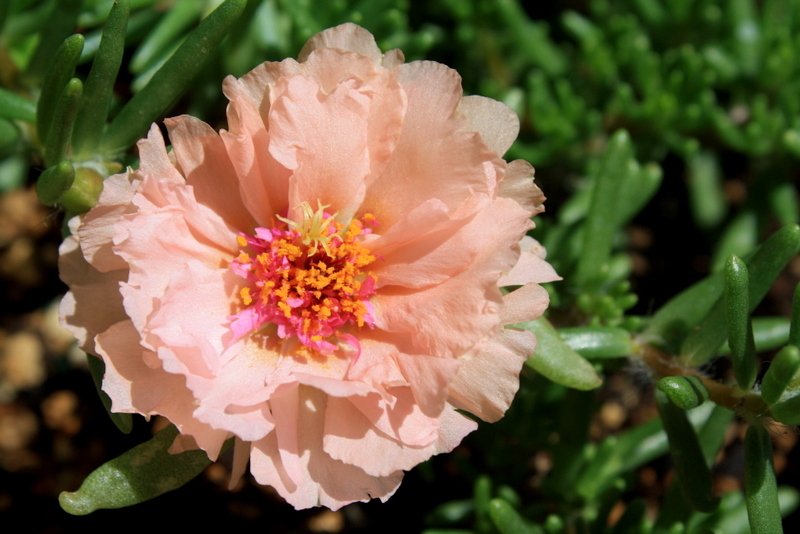 You are currently browsing the tag archive for the ‘Portulaca’ tag. A couple of months ago, I carved out an area of the back yard for a flower garden, and planted lots of seeds, mostly different varieties of Zinnias. I carefully planted one little portion with Cosmos seeds only. I waited a couple weeks, and nada. No sprouts. So then I pulled out all the seeds I’d collected the last couple of years in Albuquerque – my Penstemon, Agastache, Gaillardia and Hollyhock seeds, and more. I threw them all into the bed together willy nilly. Then I decided to pick up a few seed packets – Portulaca, more Zinnias, some wildflower mixes. Planted ’em all with no thought to straight rows or neat little bunches of flowers. I stood over the main portion of the bed and scattered them with wild abandonment like I had beforehand. I felt like the wind. Or a flock of birds. A couple of weeks later, the Cosmos portion was thriving, but the rest of the bed was disappointing. A handful of sprouts that I could identify as Zinnias, a stray Cosmos sprout or two. But pretty much nothing else. Then last week, it rained – poured – for nearly two days in a row. 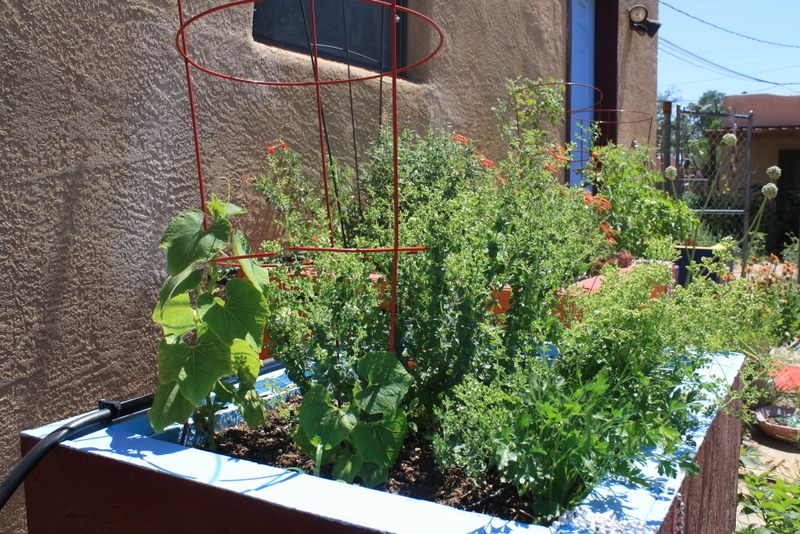 I should mention, the bed isn’t on drip irrigation, but I was very good about keeping it moist so the seeds could germinate. But I had nothing on the rain. Suddenly, I had dots of green galore. Yay! My takeaway here isn’t that I should’ve been more diligent about planting in an orderly fashion. It wasn’t that I’m going to need to thin those when they get a little bigger. And it wasn’t that perhaps I should’ve exercised more patience from the beginning. My takeaway from this is that I love rain in the desert. One thing I don’t like about the desert? The spring winds. I thought I’d escaped the ones that hit New Mexico by living in the low valley of Arizona. But I was wrong. A few days after the rain, we had 45-50 mph gusts of wind for a whole weekend. Which brings me to another first in the garden: First major cleanup of spring. 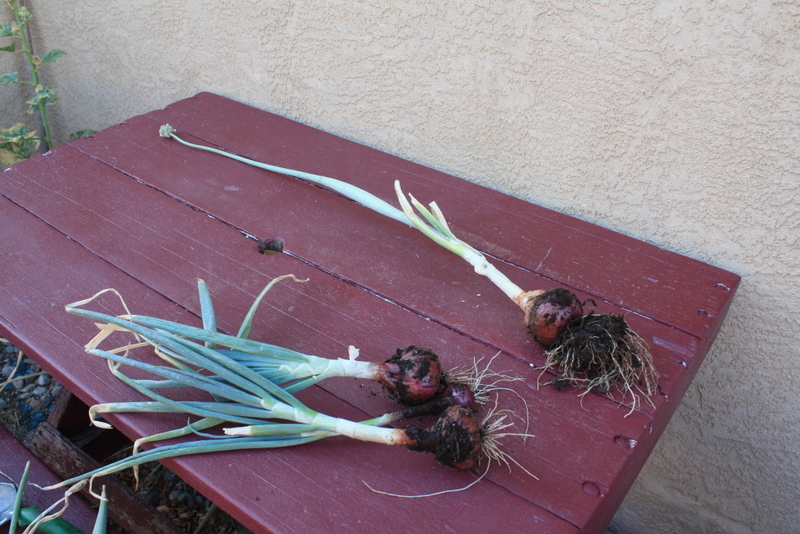 Even though many of the onions I’ve harvested have been small, I would call the winter-growing experiment a success overall. I planted fifty sets, nearly all of them grew a little, most of them grew a lot. With the limited amount of growing space I have, if I can move the onion growing to the winter months, that would be awesome. 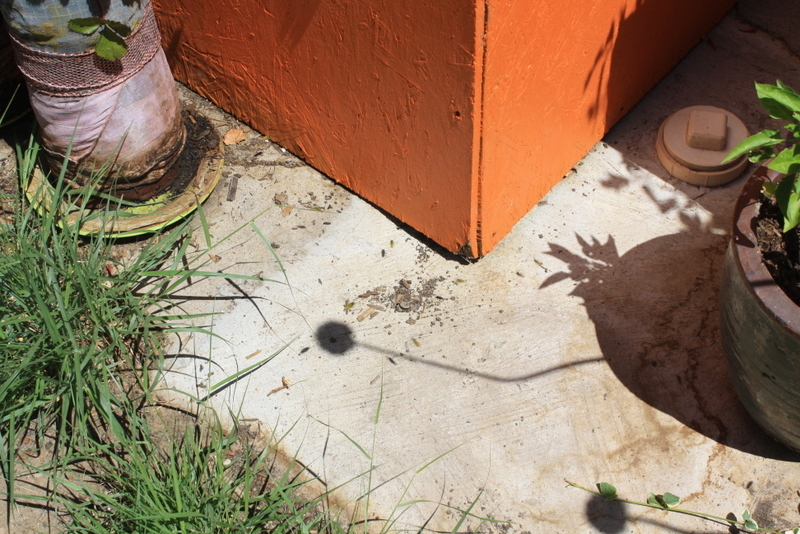 I’m going to keep experimenting, the next time starting with seeds from some of the bolted plants. I can’t imagine ever tiring of their cheerful little mugs. In other flower news, PORTULACA!!!! This particular Portulaca plant is in a very inhospitable spot, so kudos to her for growing and blooming all by herself. It’s an impressive accomplishment. And now for the week’s top story. Is also home to a bunch of wasps. No bueno! It’s hard to see them in photos, but they’re flying all over the place. I could see them crawling in and out through the gap between the container and the sidewalk. At first, I was inclined to leave them alone. They weren’t bothering me, I wasn’t bothering them. We had a zenlike arrangement. But they started multiplying, and becoming aggressive. It became apparent that I couldn’t let them continue. They have stingers! I also have a neighbor in back who shouldn’t have to pass through a gauntlet of wasps every day. They’re no different from goatheads or other noxious pests in my mind, and so I decided to eliminate them. I asked Lewis (our very own Expert Lewis) for advice, and he recommend rubbing alcohol. Said they would be overcome by the fumes. I decided to try it. Since there was no way to pour rubbing alcohol into the container, I poured some on to a paper plate, thinking I would slide it under the container in that gap above the sidewalk. I didn’t even get the plate pushed under – I set it down next to the container – before the wasps began dying. Within minutes, they were all dead. It was astonishing. I’ll spare you photos of the carnage. It’s always a little unnerving to me to cause mass death like that. I’m a peaceful person! At the same time, I’m not going to voluntarily give a bunch of mean stingy flying bugs a free place to live. If the honey bees would like to move into the wasps’ place, they are welcome. I’m not worried about them stinging me – we definitely could work out a zenlike bargain to coexist. But then, they’re not aggressive like wasps are either. 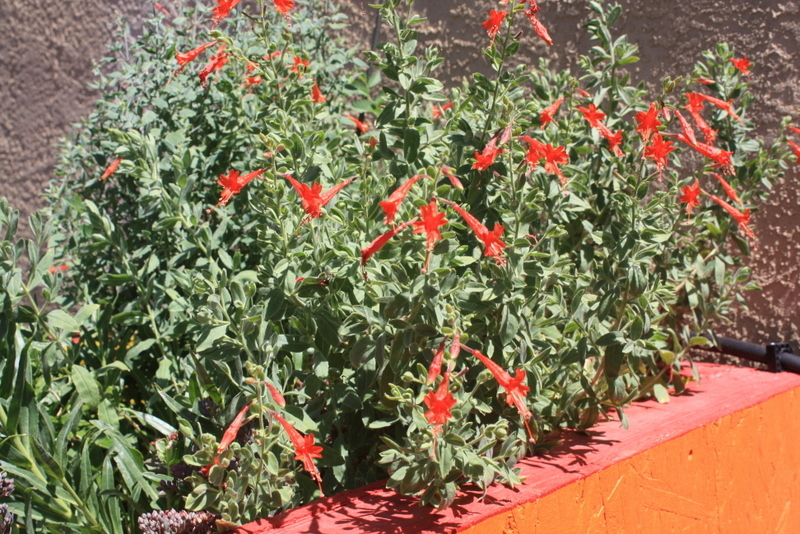 One bright spot, no Zauschneria flowers were harmed during the killings. Those are the week’s top plant stories. Thank you for tuning in. I’ll be back tomorrow, hope to see you back here. Not the greatest photos, but such a chill houseplant. Low maintenance, fast growing. I love those bright red blooms – you can seem them from a long way away. They were an unexpected surprise. I had no idea what the blooms would look like. There should be lots more in the coming months. 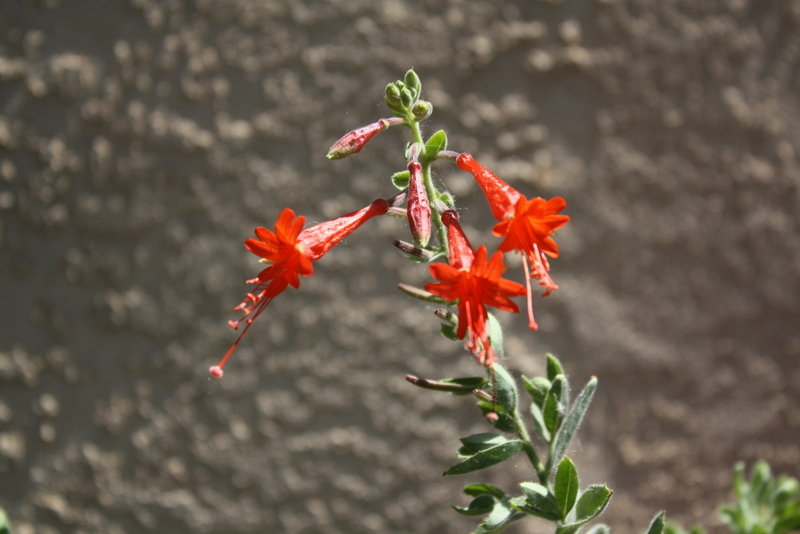 I’m really glad I decided to add the plant to my container garden – I love fall-blooming plants. I’ll be cutting that Bougainvillea back so the Zauschneria can really shine. Those little guys thrill me no end! Man, I love flowers! They make me smile every time I see them. We have been getting some rain in Albuquerque, which is great. It’s much appreciated. The flowers in the orange container love it, as do the tomatoes. One side note…I planted marigolds in all the containers to ward off pests, but something ate the marigolds in the purple container. Stripped them of all their leaves. Not sure who did that but I thought it was amusing. Whoever it was left the marigolds in the other containers alone. For now. I’ll be keeping my eye on them! Thanks to Carol over at May Dreams Gardens for suggesting we post photos of our flowers on the 15thish of each month. If you don’t have a blog but would like to share your flower photos, you’re welcome to email me pics and I’ll post them tomorrow. Hope to see you back here! This crap had to go on a recent warm afternoon. Most of the flowers were frost-bitten but surprisingly there were lots of new flower buds. Apparently the Blanket Flowers aren’t ready for dormancy. There were other surprises, too. It’s hard to believe they could hold on in the shadow of the monster basil. But they did. Surprise! I did not expect to find those. Cleaning out garden clutter is always a lot of work, but it’s worth it. Come spring, I’ll be glad I got the hard work out of the way. What about you? Have you cleaned up your garden yet, or are you going to wait until spring? Albuquerque’s first frost was Sunday night. In one swoop, my back door container garden has been wiped out. Thank you for your cheerful blooms which greeted me every day from June until November. Ouch! You look terrible. But thank you for your service all summer – you tasted great. Still have lots of basil seeds – any takers? Goodbye pretty Zinnias and Portulaca! You were happy additions to my container garden, thank you for beautifying the place! 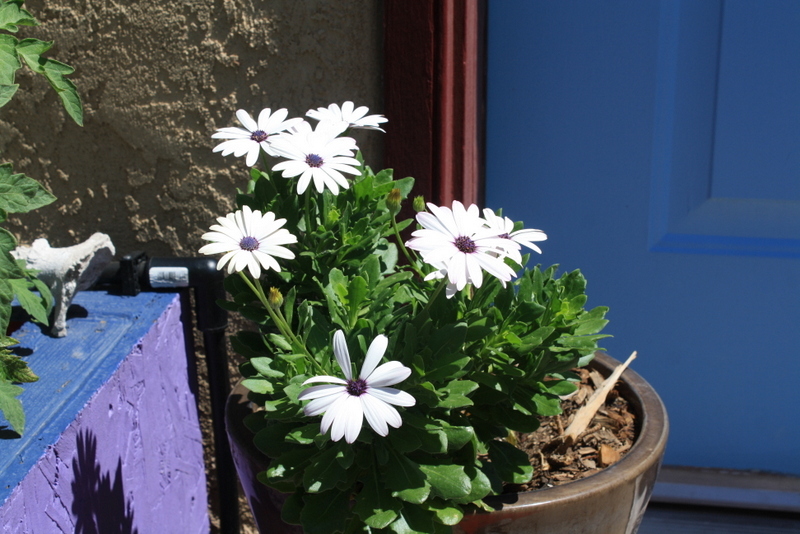 Bye Osteospermum, you’ll be missed! I’ll be back manana, hope to see you back here.